This quinoa asparagus salad with a lemon pesto drizzle is a delicious way to get those fresh veggies in. The quinoa adds protein and helps to make this salad filling. The last week in July is full of birthdays for this family, which means lots of food and lots of cake. Ugh, I had entirely too much sugar this past weekend. I definitely needed a large dose of vegetables to make up for all the junk I ate. Of course all that birthday partying meant that I hadn’t had time to plan any meals for the week. 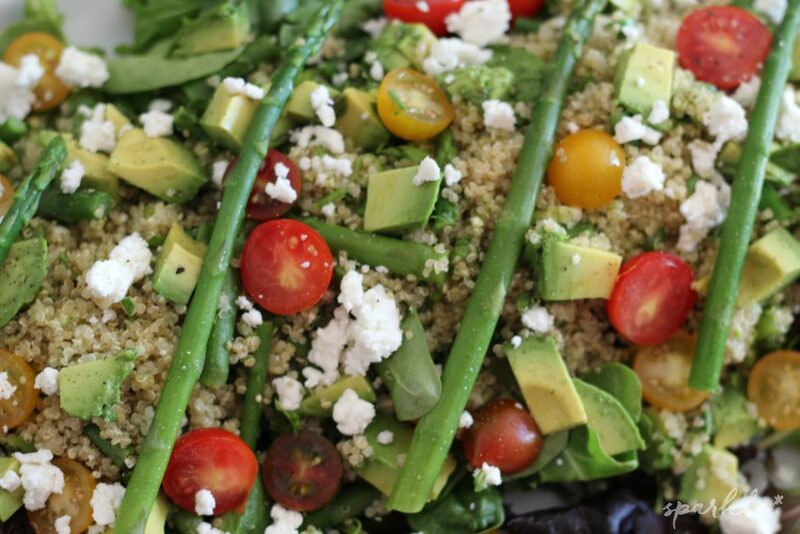 This quinoa and asparagus salad came together as a happy accident. One of my pregnancy cravings has been tomatoes (you can see my favorite tomato salad recipe here) but yesterday all I wanted was cold asparagus. Is that weird? I made the quinoa ahead of time, so that it would be properly chilled for the salad. Um, actually I made it twice because I burned the first batch. I seem to do that when cooking grains on the stove, I guess I should pay better attention. 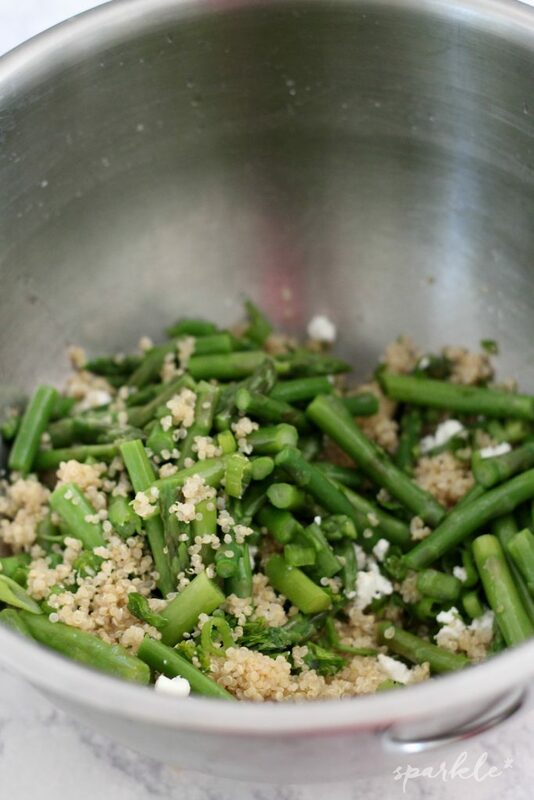 The quinoa is mixed with finely chopped parsley, finely chopped green onions, a little crumbled feta and the blanched and chilled asparagus pieces are mixed in. Add some freshly ground pepper and about half of the lemon pesto mix to season it. Then set aside. I love cold asparagus. Blanching it is easy. Add 2 tablespoons of kosher salt to a large pot of water and bring to a boil. Snap off the the base of your asparagus and cut the spears into 1.5 inch pieces. I always leave some long for garnish. Once the water is at a boil, throw in the asparagus and cover. Cook for 2.5 minutes. I like to have an ice bath ready to throw the asparagus in to chill. It seems like it makes the asparagus really green, but I think it’s entirely optional. After blanching, drizzle a small amount of olive oil on the asparagus and chill. The lemon pesto drizzle is made with prepared pesto from the store. I always seem to have plenty left over, so I’m trying to find new ways to use it. I cut a lemon and squeezed the juice of a whole lemon into three tablespoons of pesto. The lemons I got were really large. I was feeling super lazy and ordered lemons from Amazon Prime Now. They arrived at the house within two hours and I was thrilled that I could stay in my jammies all morning. But those things are huge. Nothing like the ones we get off the trees here in the winter time. Oh well. Half the the lemon pesto mix gets poured on to the quinoa mixture, the other half is reserved for a drizzle once the salad is served. 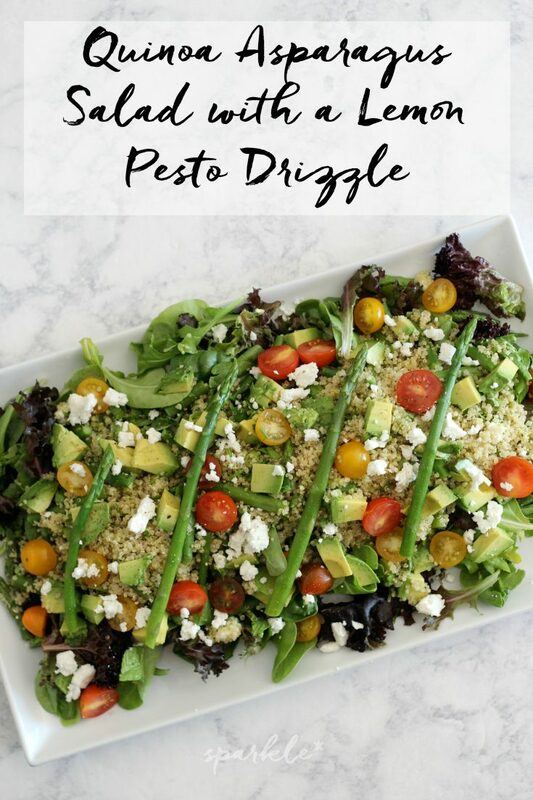 Calling it a drizzle seems so pretentious, but it has such a big flavor that you don’t want to pour it on like a salad dressing. Place the quinoa mix on to a bed of mixed greens. 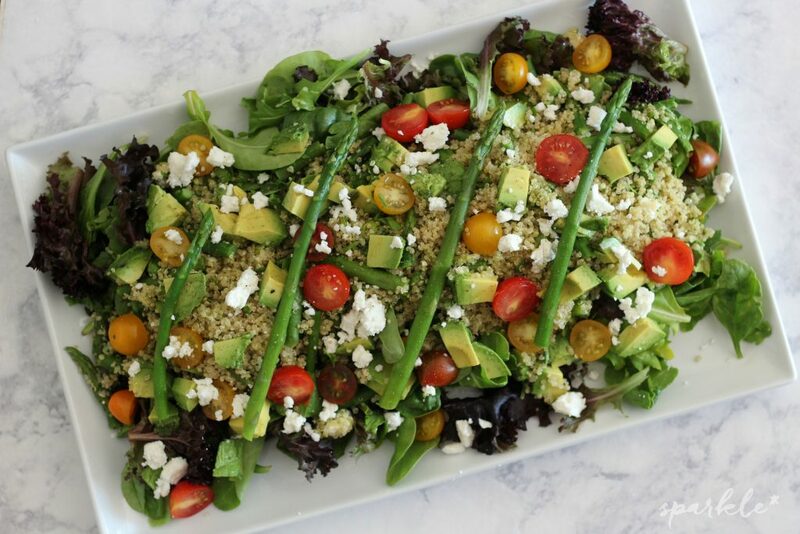 Top with chopped avocado, cherry tomatoes, more feta and garnish with blanched asparagus spears. Eat up! Prepare quinoa according to package directions. Once cooked, set in refrigerator to chill. To blanch the asparagus, add two tablespoons of Kosher salt to a large pot of water and bring to a boil. Cut the firm bases off the asparagus and chop into 1.5 inch pieces, reserving a few spears whole for garnish. Add asparagus to boiling water, cover and cook for 2.5 minutes. Promptly remove and chill or place in an ice bath. 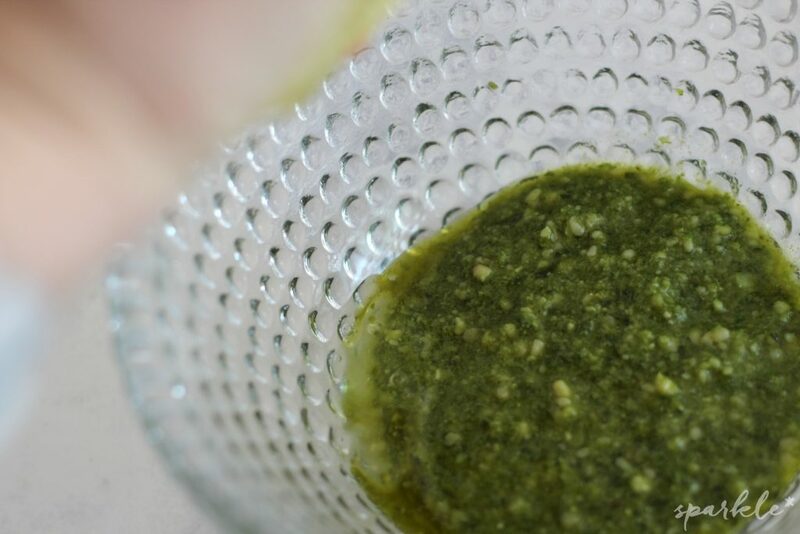 In a small bowl, mix lemon juice with pesto. 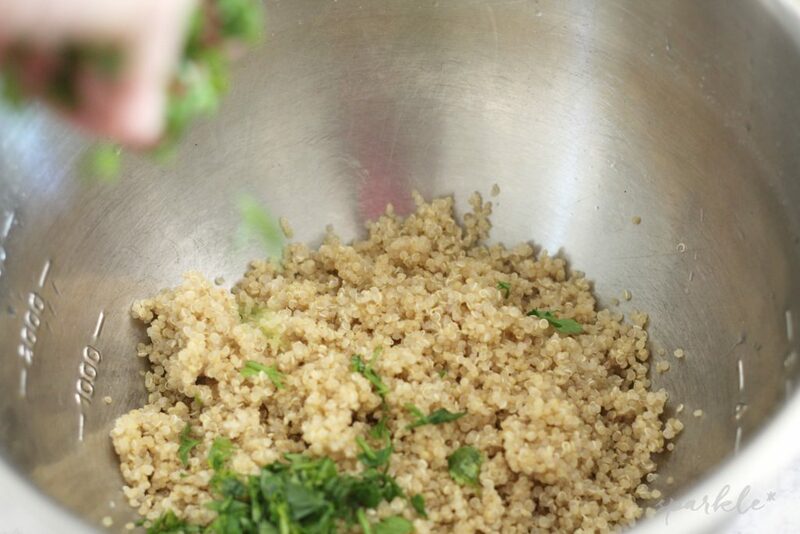 Mix quinoa, flat leaf parsley, green onions, half the feta and some freshly ground pepper together. 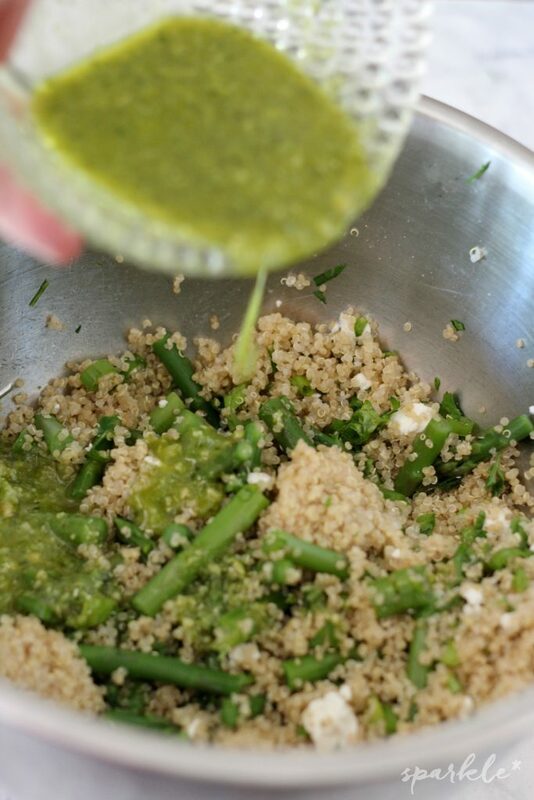 Add half of the lemon pesto to the quinoa mix. 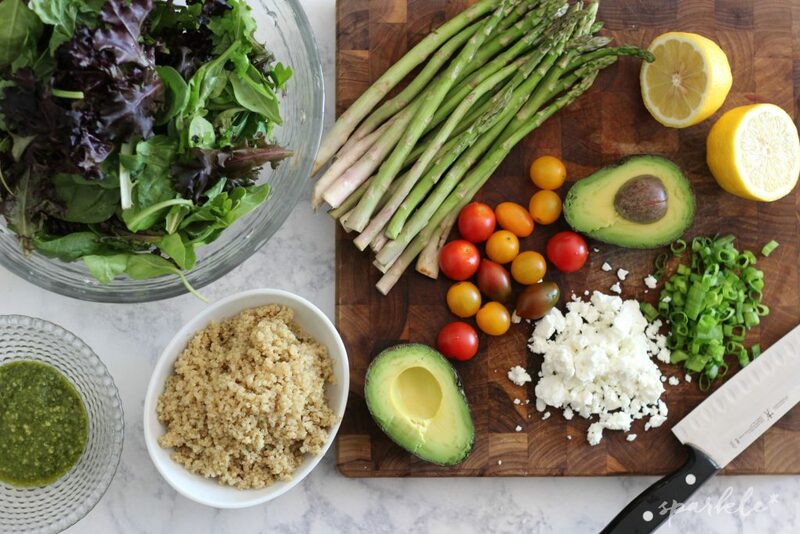 Place quinoa onto a bed of the mixed greens. Top with chopped avocados, halved cherry tomatoes and the rest of the feta. Garnish with asparagus spears. Drizzle the remainder of the lemon pesto on the the salad. 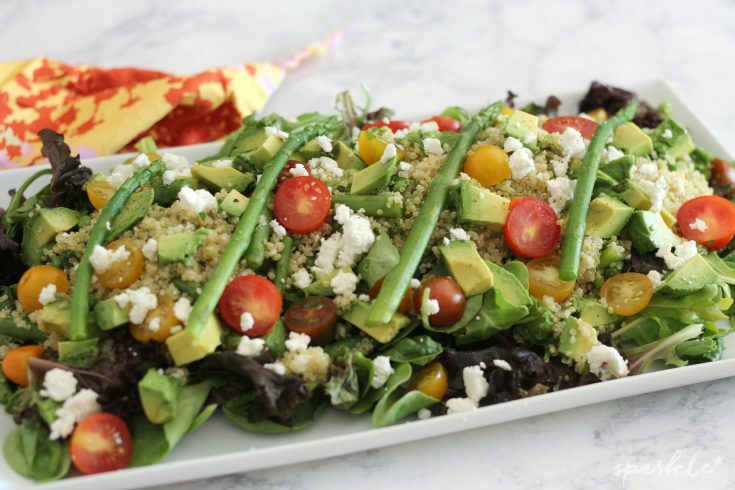 This quinoa asparagus salad is my new favorite salad. Next time I’ll add some grilled chicken. Delish! Beautiful salad! 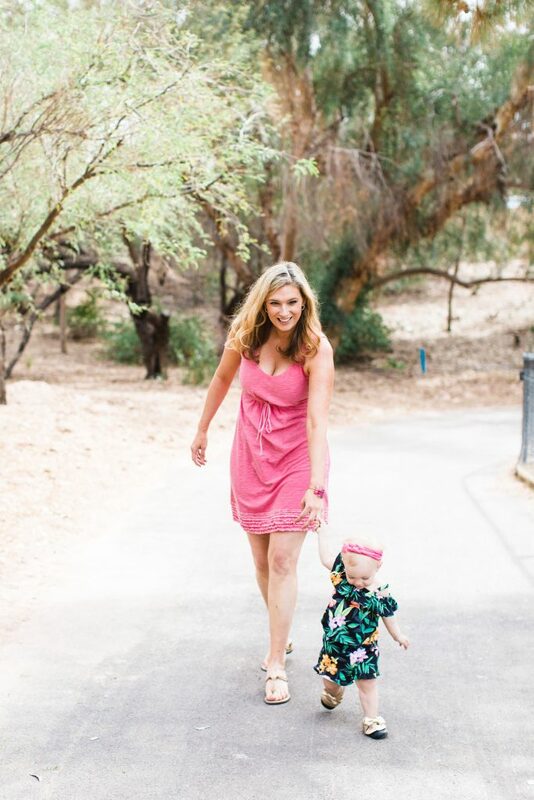 Thanks for sharing on the What’s for Dinner link up and don’t forget to leave a comment at the party – Next weeks features that also leave a comment get pinned and tweeted! This looks amazing! I was looking for a little lunch inspiration and I’m glad I found it here. Thanks for sharing! 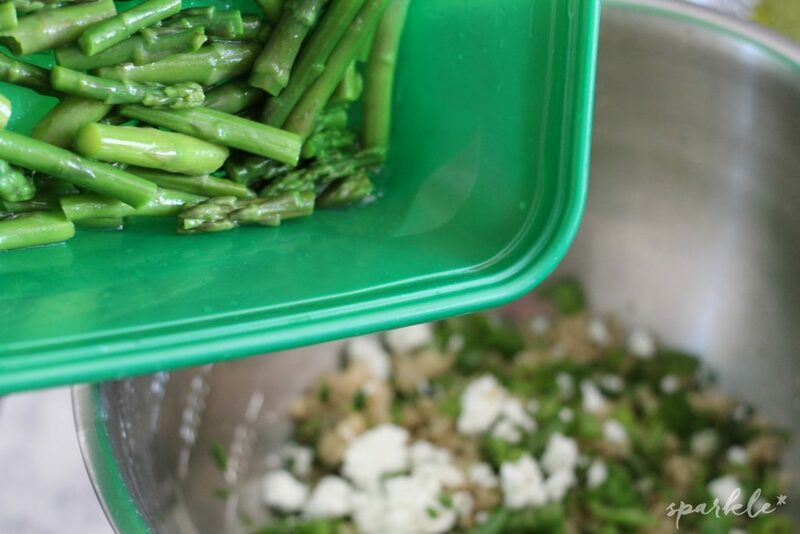 Pesto and asparagus is always a great combo! Looks so yummy. Thanks for joining the Family Joy Link Party! Oh wow, this looks and sounds soooo amazing! I should whip this up this weekend. Yummy! This looks like something that would be served in a restaurant. It looks delicious. 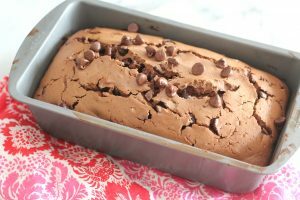 Yumm…this looks so delicious! I love asparagus so I’ll have to save this recipe! Thanks so much for sharing with us at Share The Wealth Sunday! This is full of everything I love from fall. Going to make for dinner this week after I buy some asparagus! pinned. Looks so yummy & refreshing. 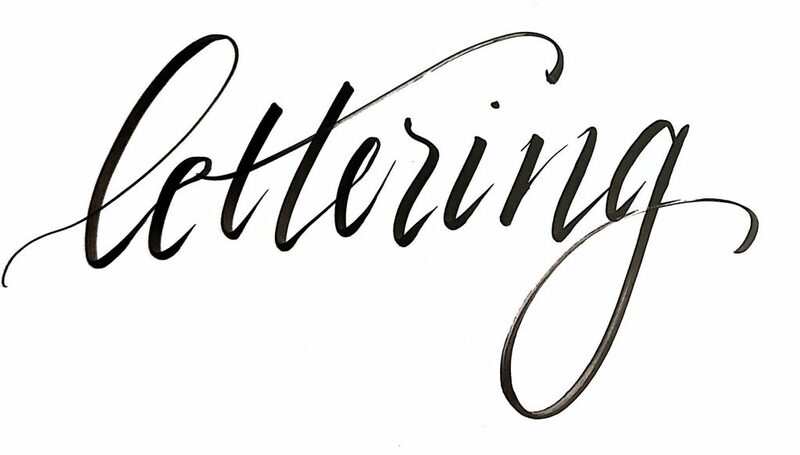 Thanks for sharing at the #InspirationSpotlight Party! Pinned & shared. I love pesto and I just had asparagus today (yay hospital cafeteria, haha)! :O This sounds all sorts of amazing!